Egg binding or dystocia refers to a condition in which a female bird has trouble laying an egg. This condition can be life threatening and is unfortunately common in our smaller pet birds (budgerigars, cockatiels, lovebirds, finches, canaries). At the Center we see many cases of egg binding each year, and we believe most of them could have been prevented. The following xrays are of birds that were seen here this past year and were diagnosed with egg binding. Their owners reported the following clinical signs at home: straining, loss of appetite, weakness, fluffed feathers, difficulty breathing, distended abdomen, and large, wet droppings. 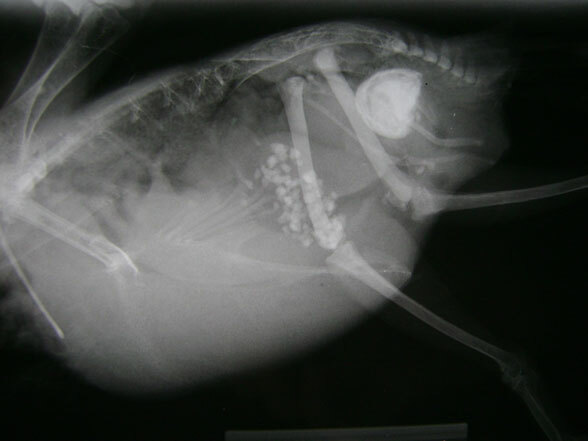 If we suspect egg binding, or feel an egg in a bird’s body cavity, taking an xray gives us important information about the size and shape of the egg and where it is located. Egg binding can occur when an egg is overly large, malformed, broken, joined to other eggs, has a soft shell, or even when the egg appears completely normal. There are many predisposing factors that can lead to egg-binding, but luckily this condition is often preventable. Birds on all seed diets which are deficient in calcium and vitamins have an increased frequency of egg binding. Egg binding is also more common in birds with additional health problems, obesity, lack of exercise, advanced age, poor environmental conditions, and in birds that lay excessive eggs. In order to prevent egg binding and other serious health issues we recommend that birds have yearly wellness exams. In addition to regular physical exams and health screening, we can guide you on how to properly feed and exercise your bird as well as avoid egg laying behaviors.